This is a cast of Will Rogers that was created as a plaster by the American artist Hughlette Wheeler which was cast in bronze after the artist's death. The edition was planned to be cast in 100 bronzes, but it was not completed and only 30 or less were actually cast, then the molds were destroyed. This is cast number 19 and finished in a brown patina. 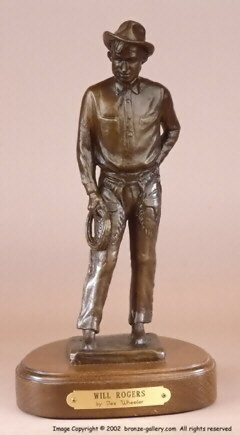 Wheeler created several bronze sculptures of the famous American satirist Will Rogers including a monument of him on his favorite horse "Soapsuds" that was erected to honor Rogers.